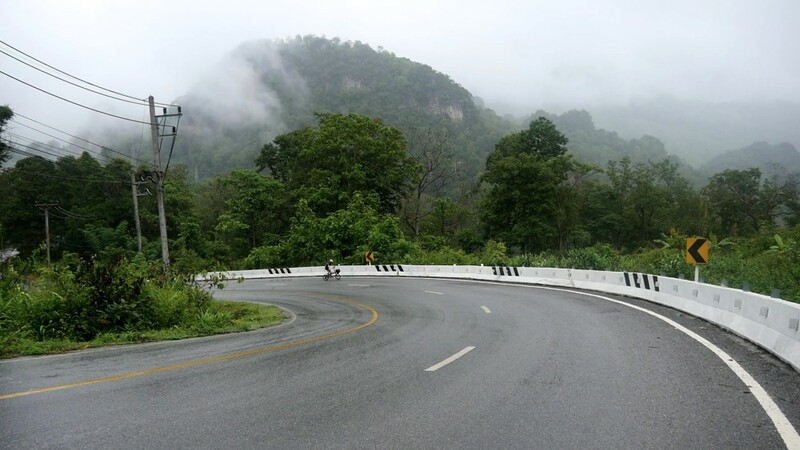 North-west Thailand is home to one of the most spectacular sealed road loops in the world: the Mae Hong Son. It’s especially well-known amongst motorcycle tourers as it features over 4000 bends, taking you up and over mountains, through forests and across bridges for its entire 660km length. By the loops end you’ll have climbed the equivalent of Mt Everest one-and-a-half times – perhaps that’s why it’s lesser-known amongst cyclists! Let’s get this straight: the Mae Hong Son is no walk in the park. 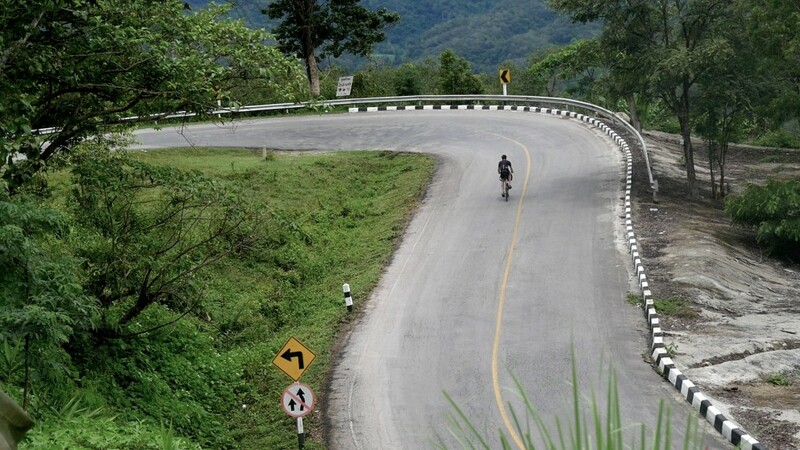 If you’re thinking of doing it, make sure you are an experienced cyclist who is partial to some long mountain climbs because those roads, well… they really push the gradient limits. You’ll constantly be rewarded with stunning vistas and natural features if you’re happy to work hard on the 20% grades all day. 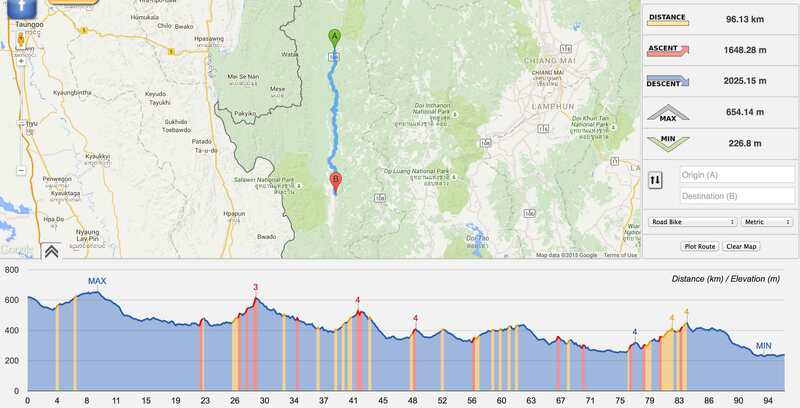 Given the mountainous nature of the route you’ll need to bring a bike with low enough gears. For intermediate riders I’d suggest using a touring bike or a mountain bike. If you consider yourself a strong rider you’ll certainly be able to complete the loop on a road bike with the right gears. More on gearing below. Allocate between 5-10 days to properly take everything in. I’ve broken the loop up into sections which you can string together to suit your own time frames and ability. Here’s the film from my time on the Mae Hong Son. 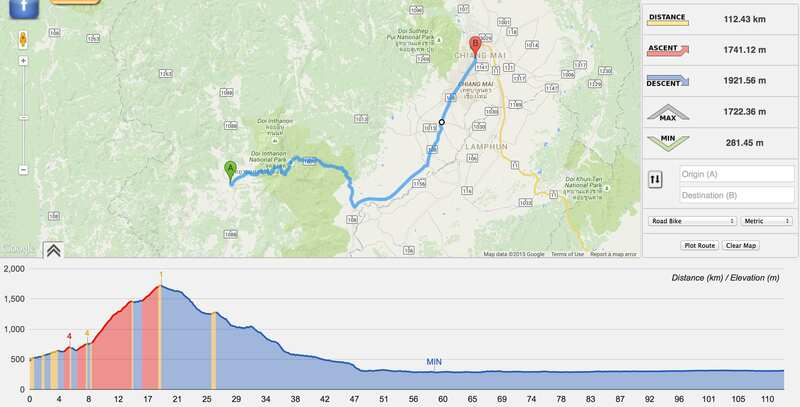 The ride out of Chiang Mai is flat and busy for 30 odd kilometres until you turn off the main road. Once you’re rolling along the 1095, traffic drops dramatically. 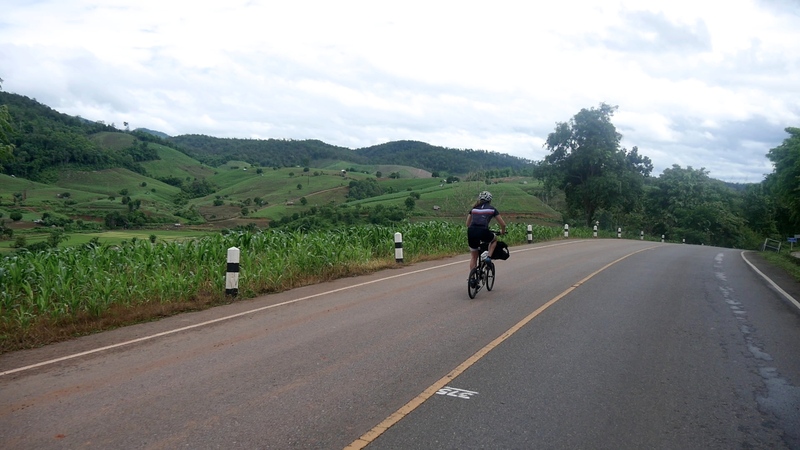 The first section is wide and open, with rice paddy fields, lots of foliage and small villages littered along the way. The road then narrows and you get into some climbing. You’ll find lots of slow moving trucks around here as the gradients are well over 10% for most sections. 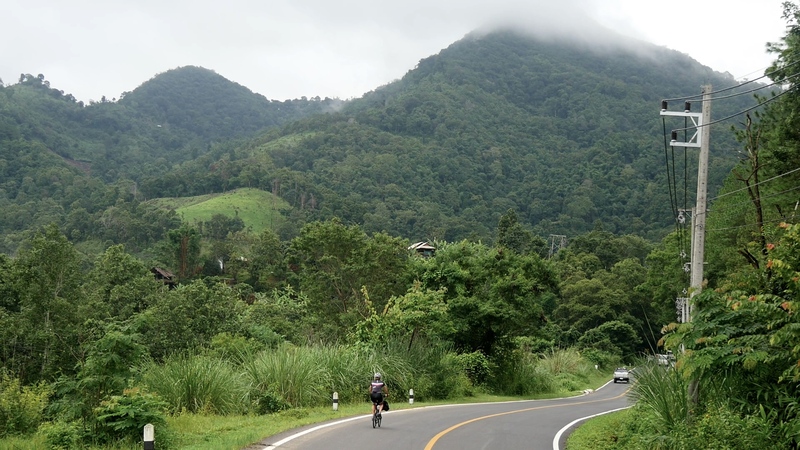 About 27km along the road to Pai (60km from Chiang Mai) are accommodation options in the form of ‘resorts’ if you need them. 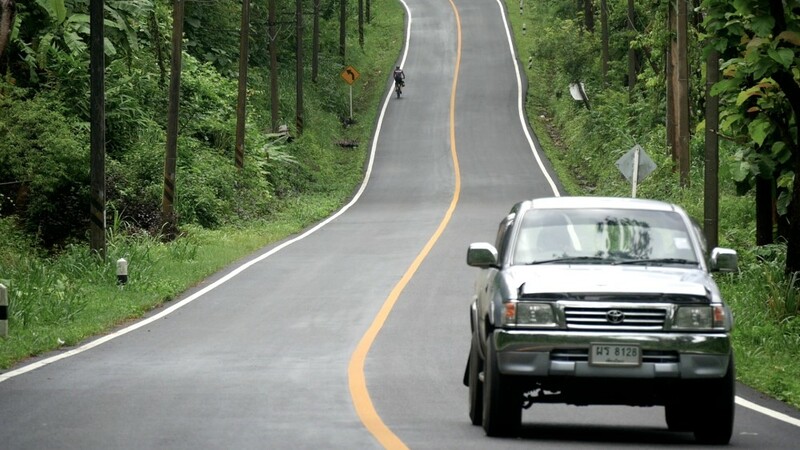 You’ll then climb to about 1400m as you get closer to Pai, before a long, twisty descent that drops nearly 1000m into the town. 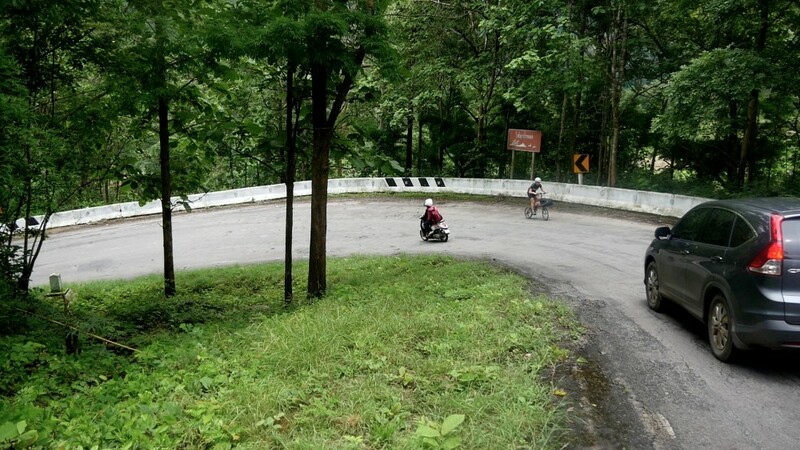 There are spiralling hairpins all the way down – it’s really hard to wipe the smile off your face! Pai is a tourist town, so you will find lots of accommodation and food options here. Due to the international crowds, the street food is exceptional! Get ready for some vertical metres! 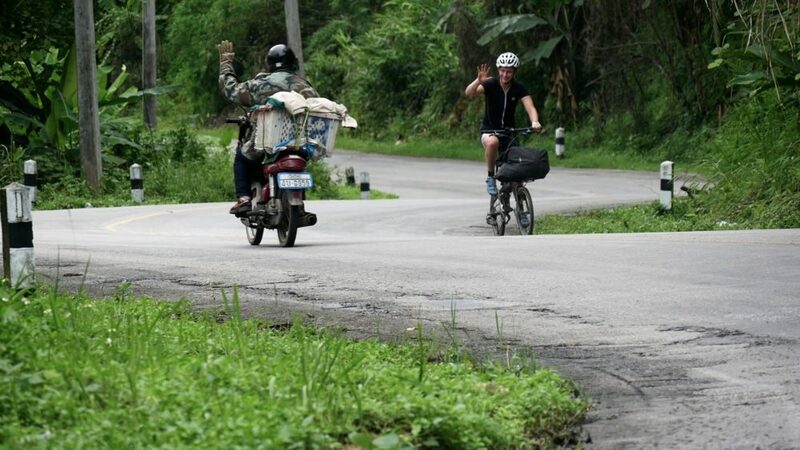 The ride starts off calm and then all of a sudden you’re hit with a long and steep road up to 1500m where you’ll find hill tribespeople selling you chips and drinks. The descent, like the one into Pai, is phenomenal. Hairpin corners snake right down the hill, exposed rock faces smile at you from every direction and the road breaks through a few narrow rock gaps. 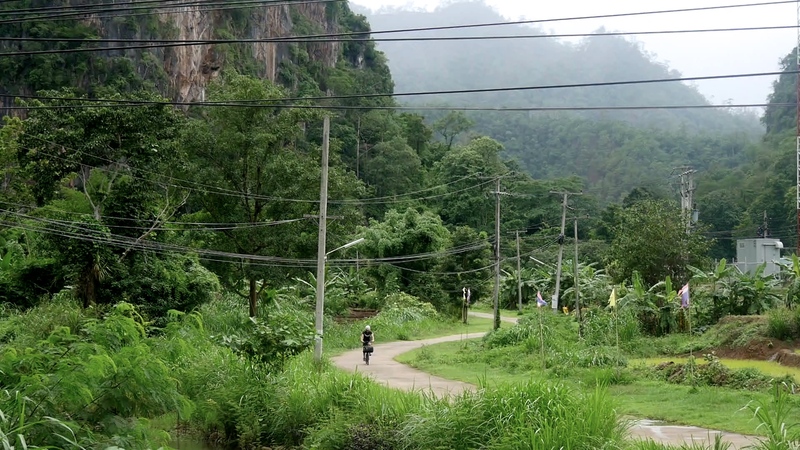 Soppong is a quiet little town with a handful of guest houses and restaurants. 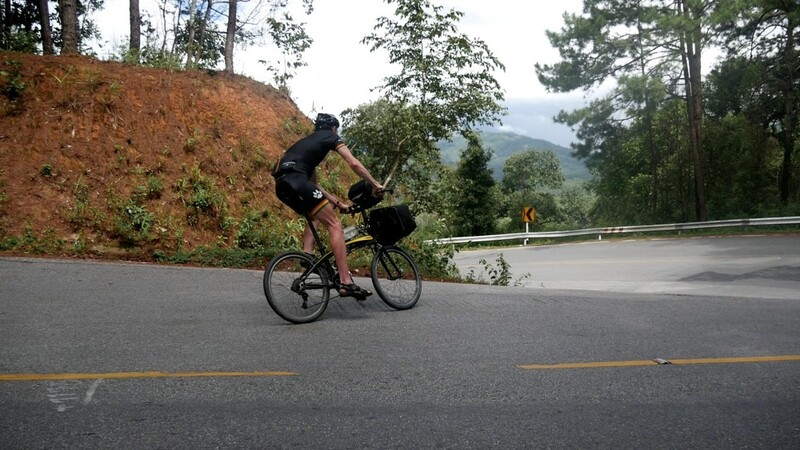 The remaining 66km to Mae Hong Son contains short and steep climbs, perhaps six notable ones along the way. 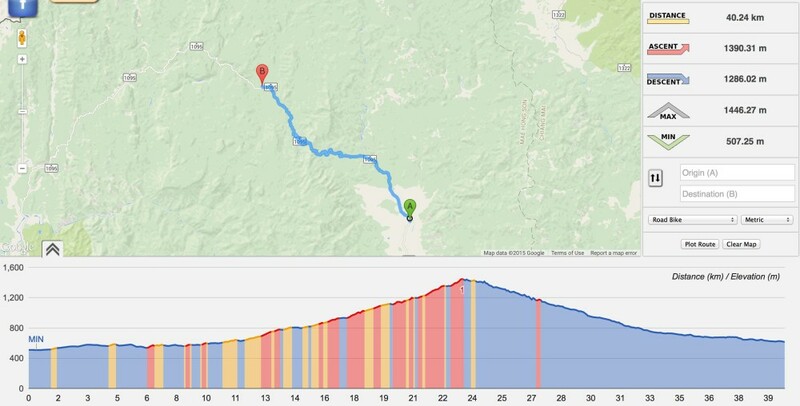 Most of these climbs have sections of 20%+ grades but I heard that some bits even exceed 30%(!) at their steepest. You may need to start zig-zagging to avoid getting off! 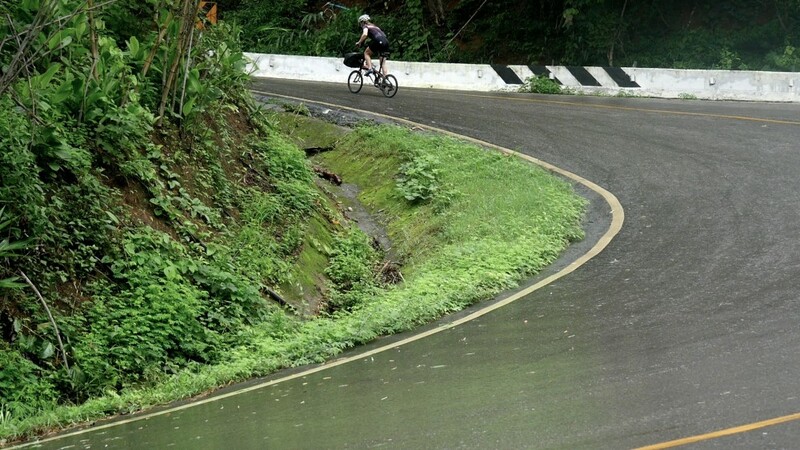 Each of these climbs is matched with an equally impressive descent, so make sure your brakes are tuned well. 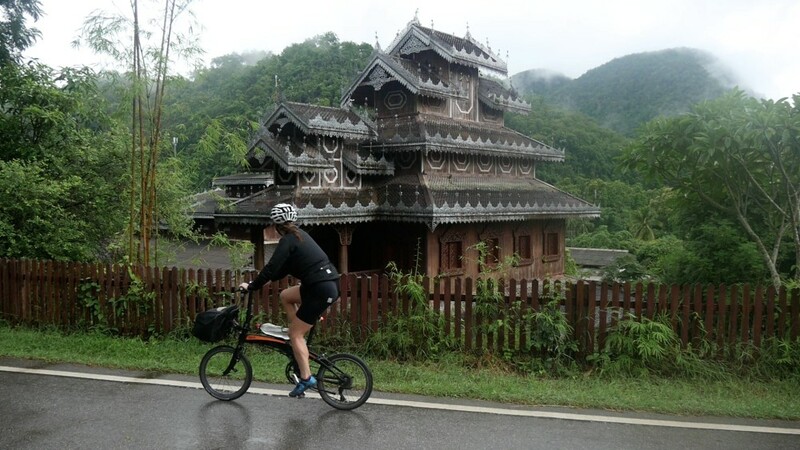 Mae Hong Son has lots of things to do and see and is much less touristic than Pai. I’d recommend taking a day to explore the surrounds. This ride is easy compared to the previous few days, although you’ll still manage to get in some solid vertical metres here and there. The road surface is an absolute dream to be on, it’s smoother than anything in Australia. 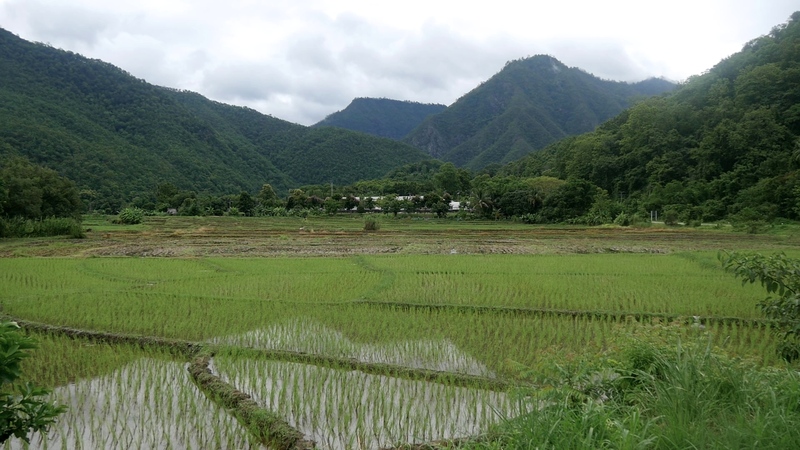 You’ll see lots of thick forest along the way, and rice fields are plentiful in village areas. Khun Yam is famous for its sunflowers around November, but otherwise is a nice quiet place for a rest. 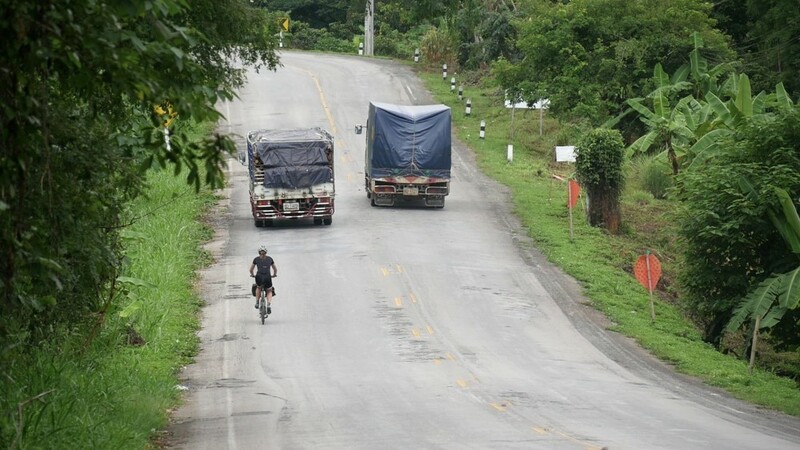 The ride to Mae Sariang contains a few short hills, but again is pretty much smooth sailing compared to what you’re used to by now. There’s lots of thick, green forest to enjoy as it keeps the heat off you. One thing to note is that after any rain, the side of the road is unbelievably slippery in this area; it’s like ice, so be careful! 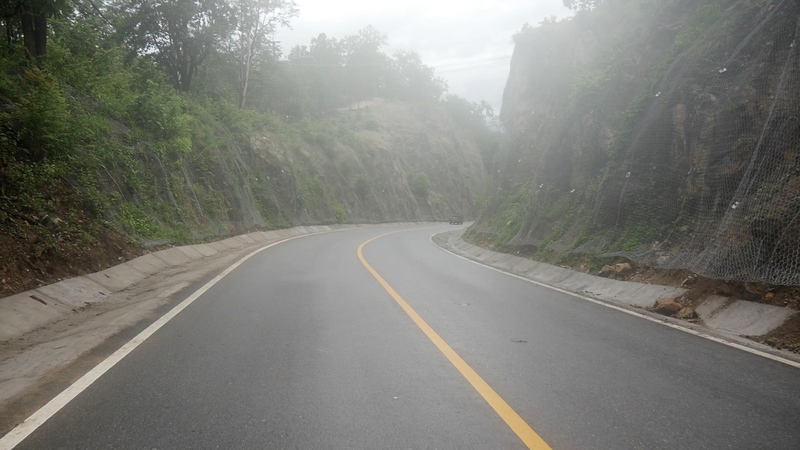 If you’re feeling a little tired you can stop at Mae La Noi which is 30km before Mae Sariang. Mae Sariang is my favourite town on the Mae Hong Son loop as it has a really laid-back vibe, and sits right on a beautiful river. You should definitely take a rest day here and wander around, it’s such a peaceful part of the world. Don’t underestimate this sector! After the first 20km/1000m climb, it’s not over. 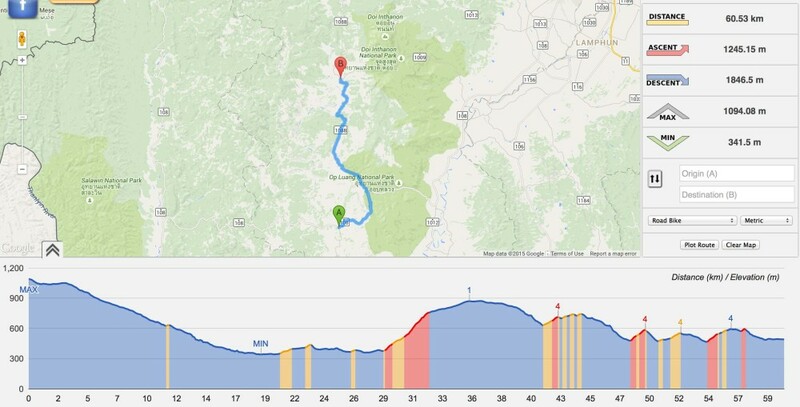 You will be treated to short and steep hill repeats for the rest of the day. That said, the whole ride is very rewarding as you roll along the top of a mountain range with frequent views into the surrounding valleys. You’ll find accommodation at a produce distribution centre just after the temple Wat Kiew Lom. The owner, Phot speaks perfect english and has a handful of rooms available. Next door is a simple restaurant/store for supplies. 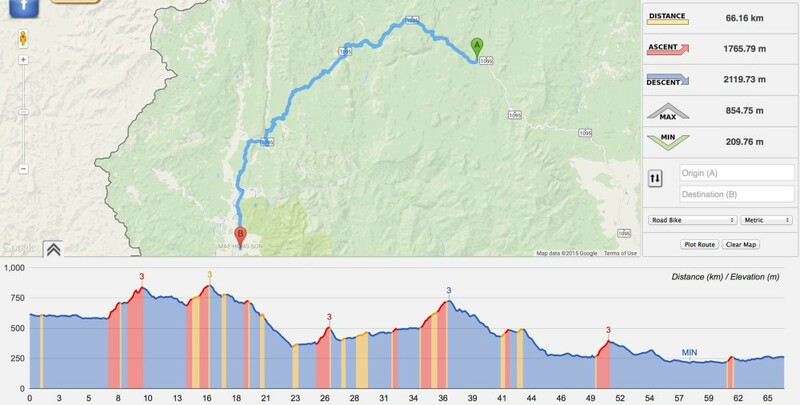 The ride starts with a long, easy 20km descent through a rocky gorge lined with deciduous trees. 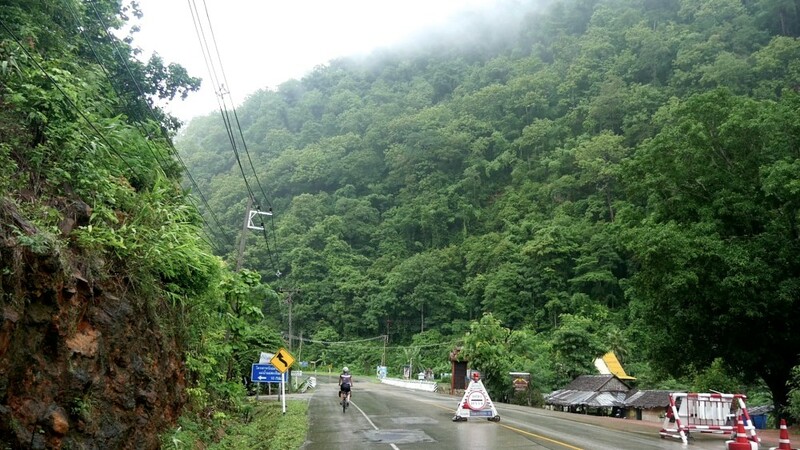 There are pine forests in sections so the environment is more reminiscent of North America rather than Thailand. Once you cross the Mae Chaem River, the environment changes again and you’re heading back into the hills. Baron, it is more or less like the Australian bush. 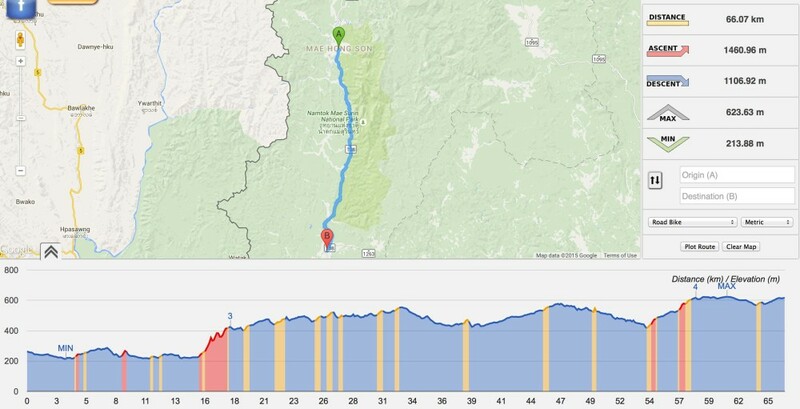 The climbing for the rest of the day is short and steep but luckily there’s not far to go. 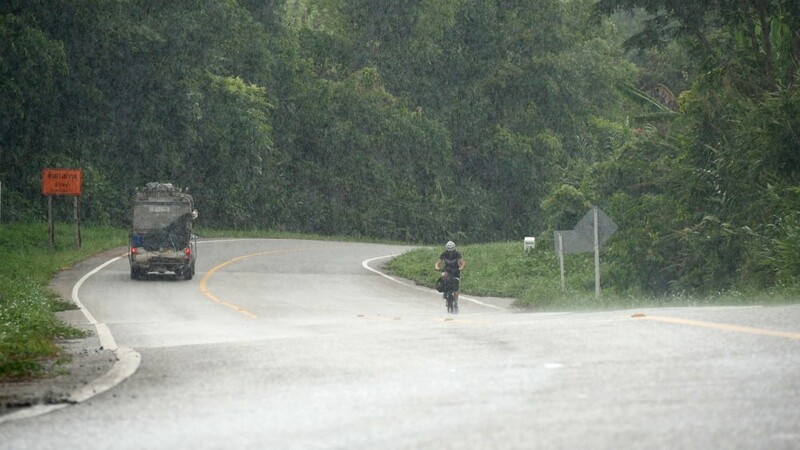 The ride out of Mae Chaem is hard. For the first 18km the gradient averages 7%, with a few long stretches of 10%+. 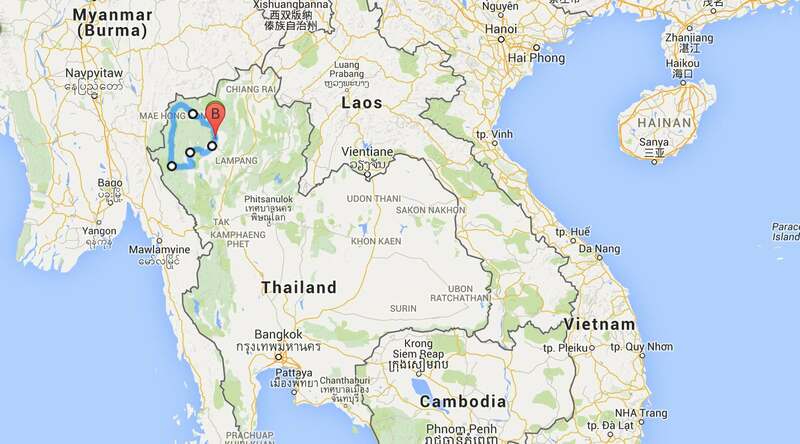 There’s an option to summit Thailand’s highest mountain, Doi Inthanon, if you feel the desire. You’re already there, so why wouldn’t you? 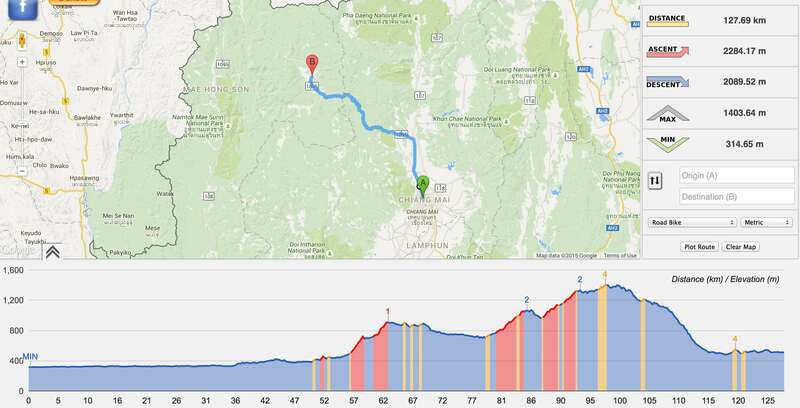 It’s an up and back job, a summit distance of 9km from the turnoff which hands you an extra 900m vert @ 12%. Once you’ve turned around, the next 40km are almost all downhill right to the main road. 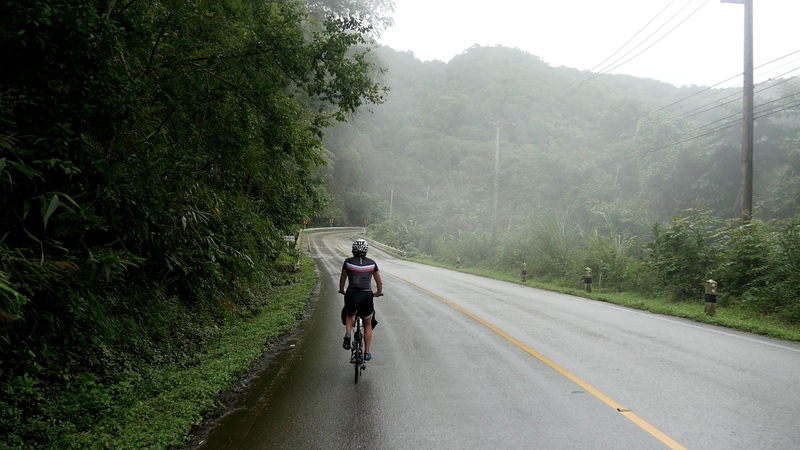 Like the ride out of Chiang Mai, the ride in is just as dull. Some cyclists catch a jeep into town to save the stress. That’s your call. Thailand is hot all year round with daily temperatures reaching a minimum of 30 degrees celsius. November through to February is the most pleasant time of the year to ride, with the lowest temperatures and chances of rain. 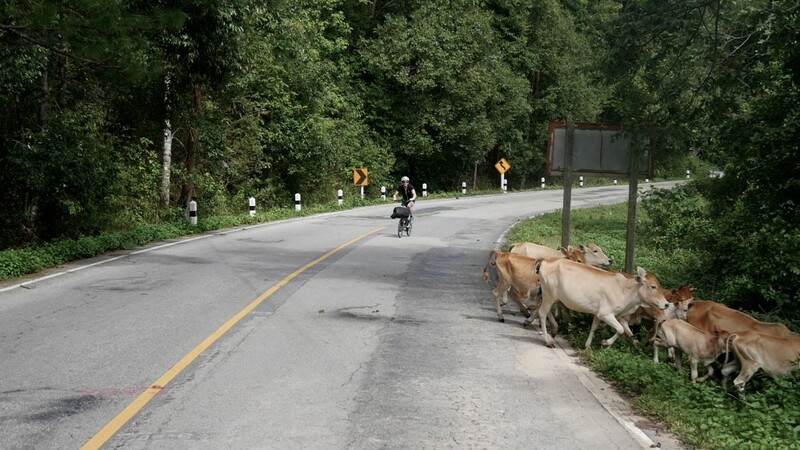 Between March and May the sky is clear and the temperature sits between 35-40 degrees – this is by far the least desirable time to be riding hills in Thailand. June through to October is the monsoon, so you’ll experience rain every day, peaking in August and September. I tend to enjoy the rain as it keeps me cool on the climbs. Accommodation is frequent, as are restaurants and shops for snacks. That means you really only need to bring clothes, toiletries and a few bike spares (brake pads are a must, mine wore through very quickly). During some times of the year, it can get quiet cold on the mountain summits (around 10 degrees) so prepare a jacket for these occasions. 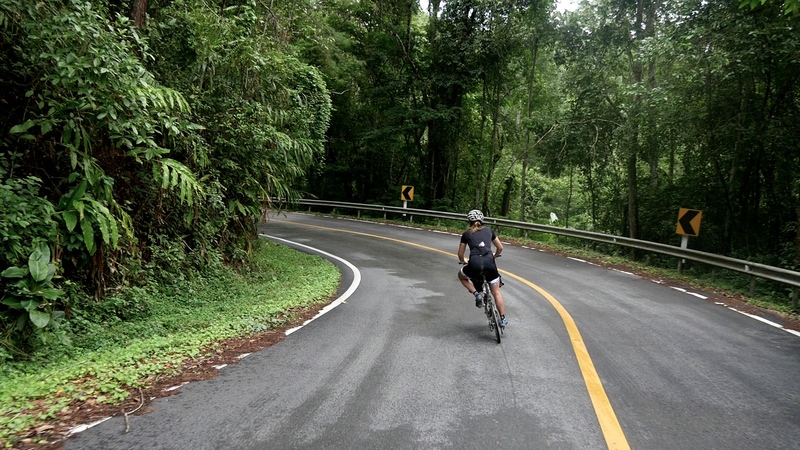 A hot tip: leave everything you’re not going to need in Chiang Mai and make the hills easier for yourself! What gear ratios do I need for the climbs? This will depend on how strong you are as a rider. I recommend having a low gear of 28 gear inches (HERE is a calculator) or smaller. If you’re on a road bike, that’s a compact crankset and a wide range cassette (34x32t). Most touring and mountain bikes will have a low enough gear for the hills on this loop. What is the road surface like? The road surface is buttery smooth tarmac. Road bike riders can easily get away with their standard 700×25 tyres. I’d recommend something wider than this for comfort though. 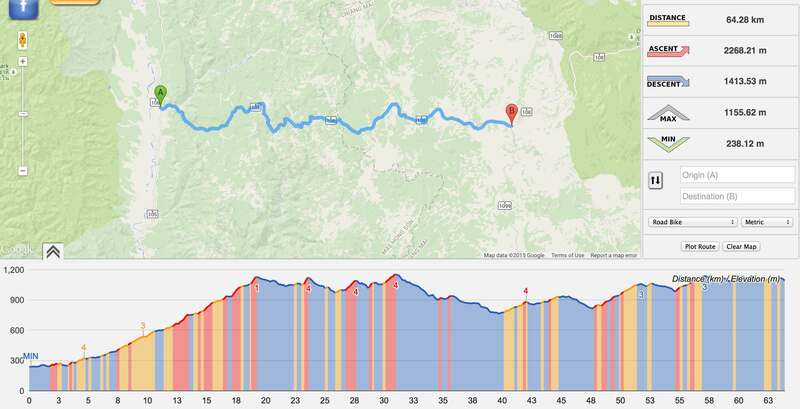 Do you have any GPX/KML files for the route? Sure do. Download them HERE! Put them onto Map.me on your smartphone using THIS guide.